Just in case your eyes aren't already full of Wolfenstein: The Old Blood video, here's another one featuring Bethesda's Gary Steinman, (once of this parish), explaining some of the more interesting aspects about traveling back in time to hang a job on the Nazis. Steinman says The Old Blood is "dripping with history," although not history in the sense of things that actually happened in the past. Instead, it's the history of Wolfenstein: The New Order, which becomes the videogame present when Nazi-stomper extraordinaire B.J. Blazkowicz travels into the past to throw a wrench into the gears of Der Führer's war machine. The Old Blood will be split into two separate stories, Rudi Jäger and the Den of Wolves and The Dark Secrets of Helga Von Schabbs, which will see the appearance of the zombie hoard, some of whom will even be packing heat. 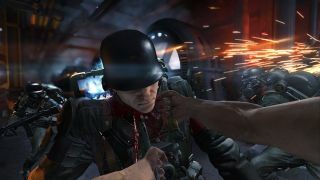 All in all, it looks to fit nicely with the "B-movie vibe" Bethesda has promised, telling "a lighter story at a brisker pace," and it's great to lay eyes on the old Castle Wolfenstein again, too. Love those gondolas! Wolfenstein: The Old Blood is out on May 5—that's tomorrow! If you just can't wait, you can catch an hour of straight-up gameplay right here.